I’m so excited! The IAAPA Attractions Expo will be upon us in a few short weeks and it’s shaping up to (again) be the most wonderful time of the year! This year, one of the educational programs I am working on is called “HR NOW – The Frontline Speaks: Insights From The People Who Are Truly Running Your Business.” In this session, we’ll hear what frontline employees from around the world think about technology, leadership, motivation and more. This is your chance to hear directly from the people who are serving your guests! We’ll have 3 frontline employees from various attractions as our panelists in the room, and we have also gathered video footage of frontline employees from parks around the world answering the same questions we’ll be asking our in-room panelists. During the session we will play some of those clips in addition to hearing directly from the panel. You won’t want to miss this! Now back to our title… in reviewing the video submissions that came in, an interesting trend emerged. When talking about what motivated people, or what would even cause people to leave, many answers were different sides of the same coin. And that coin is… CHALLENGE. One employee said it was very motivating when their supervisor assigned them more complex tasks, and another said he would leave if there were no more challenge to the job. Yet another spoke at length about how he had left his park for another job… a 9 to 5, weekends off, low-stress kind of job, but it didn’t last. He craved the excitement, variety, and yes, challenge of his old job. He found it by going BACK to the park. I first heard T. Scott Gross say this during an education session at IAAPA back in 1997… “The only people who want to do idiot-proof jobs are idiots.” I think it was true then, and it’s even more true today. We can’t expect our employees (especially young employees) to be satisfied with same-old, same-old, hum-drum jobs where all of the challenge and decision making were removed to make sure no one made a mistake. People don’t work that way… at least not the good ones, and those are the ones you want! I can’t wait to gather this panel and see what other great insights they will provide! Below are the session details if you are going to be at the IAAPA Expo in Orlando. 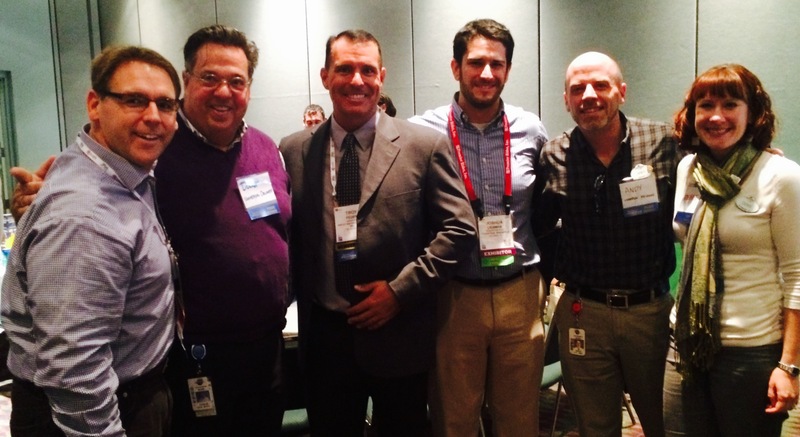 Impromptu gathering of current and former Universal Orlando Team Members at the annual Florida Attractions Association networking lunch at #IAE14. I’ve been reading a series of legal thrillers recently and the main character talks a lot about the law of unintended outcomes. This blog post is a direct result of that phenomenon. I am currently working on a leadership session and wanted to gather some opinions about what employees look for in their leader. I posed the question to former IAAPA Show Ambassadors who represent a great demographic cross-section of the young staff members many of us work with. When I saw their answers, I thought this information was bigger than the one session I was working on, and needed to be shared with as many people as possible. Thus, an unintended outcome of asking my original question. Feedback: Positive or Needs Improvement. It’s always good to know how you doing, and to get assistance with development. Empathy: Sometimes leaders need to understand what it’s like on the front line, especially if they haven’t done it in awhile. Communication: It’s the worst when a leader does not communicate with the front line important information about the daily operations. Knowledgeable and willing to teach you and help you grow. Always willing to give you constructive criticism. Sometimes I think leaders hold back on their responsibility to communicate as both professional and personal relationships build. Whenever I find myself hesitating to give feedback to a team member I always think about how much I appreciate when people give me both positive and constructive feedback. Also, someone who invests time in understanding the thought process that goes into how you do your job and how you make decisions. Especially in cross-functional teams where your leader might come from a different background then you. Someone who shows that they are committed to their team members success, and is willing to work with their team to help them achieve their goals. Someone who can effectively communicate the teams goals, small and big picture. Someone you can relate to and have fun with! Inspirational –Those that lead well are those who instill motivation in others. Altruism paired with purpose and passion produce someone with fervor enough to inspire others. I find that work becomes more meaningful when I can attribute passion to it -whether it be intrinsic or inspired by another. Leaders with this quality have an excellent way of helping an organization grow because they constantly build their teams’ esteem and motivation with the passion they carry themselves. Admirability –A true leader, in my eyes, is an authentic leader, a person respected and highly esteemed by others because of his or her ability to honest, caring, and dependable. Respect is built with time by the outcome of experiences. Leaders who demonstrate a high level of truthfulness, conviction in their teams and a sincere concern for others’ well-being, as well as a reputation for keeping promises is endeared by many but, chiefly, is respected by all. What are the common themes did you notice? How did you do on your self evaluation? Are we missing anything that YOU look for in a leader? I want to thank Bobby Monnerat, Ivey West, Todd Swetnam, Greg Matthew, Dave Mugnaini, Sarai Henning, Brandon Bruce, Alex Reszitnyk, and Krystal Lambert for not only chiming in to answer my question, but also for unintendedly contributing to this blog post and the betterment of leaders everywhere! You rock! Now that you know what your employees want, are you and your leadership teams equipped to provide it? I’m here to help your leaders lead! For the last few weeks, my car had been acting funny. The tires are in near new condition, yet in the rain it would hydroplane, and even on dry pavement it didn’t seem to hug the road very well. A friend said that sounded like an alignment problem, so I made an appointment and took it in. Turns out, 3 of the 4 wheels were well out of whack. 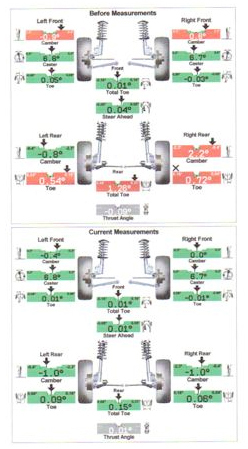 I was given a read out much like the one pictured that showed the before and after condition of my car. Luckily, they have adopted the red is bad, green is good system for us automotive morons. I immediately noticed a difference when I drove the car away from the repair shop, and was glad and proud and relieved, all at the same time. As I told my wife about this experience, she said, “that sounds a lot like what you and Scot are doing, but for businesses.” Leave it to my wife to point out something obvious that is right in front of my nose. She was right. Since the end of 2010, Scot Carson of Amusement Advantage and I have been working together to help businesses figure out where they are out of whack, and provide tools, resources and advise about how to “re-align” their business practices. 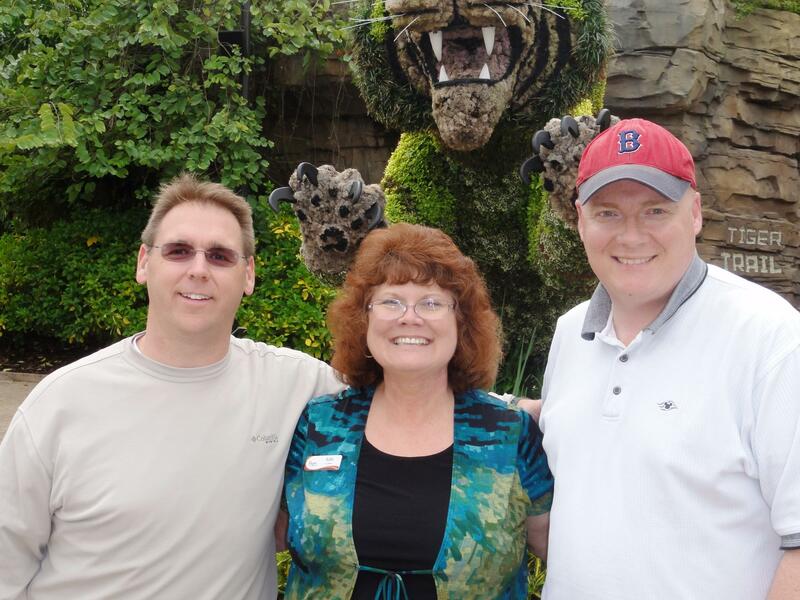 If you don’t know Scot, he runs the only mystery shopping service that is exclusive to the attractions industry. He had a number of clients asking about additional insight that could be gained from a report, or from looking at multiple reports, and that’s what I get to do. I’ll look at an entire season of reports, for example, and pull out the trends in employee behavior and guest experience that business owners can use to improve the way they lead, treat their employees or interact with their guests. In other words, a business check-up, with re-alignment if needed. Like Scot said, we do talk about what is good and what is not-so-good in the reports. People like (and need) to know when they are doing things right, and these reports identify a whole lot of goodness going on. So there are “green” sections in the reports, and then there are the “red” sections. Because we are often looking at the reports after the season ends, we are not focused on changing or “fixing” a particular employees’ behavior. Instead, it is more important for us to identify the trends or conditions that influenced the negative behavior, so we can figure out the long-term solution about how to fix it. So, if you feel like your car needs to be realigned, take it to a qualified mechanic. If you need your business realigned, that’s what Scot and I are here for. If you’ll be at the IAAPA Expo, plan to stop by and see us at booth #3927! In the 20+ years I have worked in the attractions biz, few topics have popped up in random conversation more than the dreaded mid season burnout – that slump in performance and morale we often see just about half-way through the season. And it seems like no matter what we try to do to fix it, it still keeps coming back. I had the opportunity to really study this topic a few years ago, and two things emerged. First was an article I wrote for World Waterpark Magazine called “The Employee Lifecycle”, where I explored the relationship of what we do before someone is hired, while they are employed, and after the employment relationship ends. It really opened my eyes to the fact that mid season burnout is not a middle-of-the-season issue. It’s really a year round issue that manifests itself in the middle of the season. I then realized that if that was the case, two of our big assumptions about mid season burnout were probably wrong. This then lead to the creation of the “Myth of Mid Season Burnout” program, which has been very well received at WWA Symposium, The Texas Public Pool Council Expo, and will be presented at the IAAPA Attractions Expo in November and the AIMS Safety Seminar in January. If you have questions about burnout, or any other facet of leading your employees, feel free to contact me at anytime! About the author: Matt Heller loves to travel, and TripIt is one of his favorite iPhone apps. He loves to see it full of plans and itineraries of places he will be going. He just recently embarked on a mega-coaster trip through the eastern part of the United States. The plan is to hit 8 parks in 7 days. “Aggressive” is the word he and his friends have used to describe the schedule. The IAAPA Attractions expo is almost here. For those attending, the excitement about this week is palpable. It’s like Christmas morning that lasts for an entire week. And I was reminded recently why this week is so special. The other day, a good friend and I were spending the day at Busch Gardens in Tampa. We were lucky enough to be joined at lunch by my friend and colleague, Robbi Lepre, who oversees entertainment at the park. As a bonus, Robbi was able to spend time with us after lunch, showing off the parks animal exhibits, and demonstrating a deep knowledge and passion not just for the entertainment offerings in the park, but for every aspect of what the park (and the industry) does. And that one word, passion, really stuck with me as I think about why this one week out of the year is so special. It’s the collective passion we share for the industry, our guests, and each other that make this such a rich experience, both professionally and socially. If this is your first time attending, do not be afraid to strike up a conversation with… anyone. This industry is full of talented, hard working people who are willing to share so much of what they do for the betterment of the business as a whole. There really is a big sense that this community is a family, and that “we’re all in this together”. I would encourage any attendee to take advantage of everything the show offers. The trade show is great, full of all sorts of new gadgets. There are behind the scenes tours, social events and one of my favorites, the education sessions. It’s worth your time to do your homework to make sure you don’t miss anything! I went to my first IAAPA convention in 1997, and it is still just as exciting now as was back then – probably even more so because of the friends I’ve made over the years. It will be great to see you all next week! I’ll be spending a good amount of time with my friends and new business partners, Scot and Rob at the Amusement Advantage booth #4510, so if you are on the floor, please stop by and say hi!